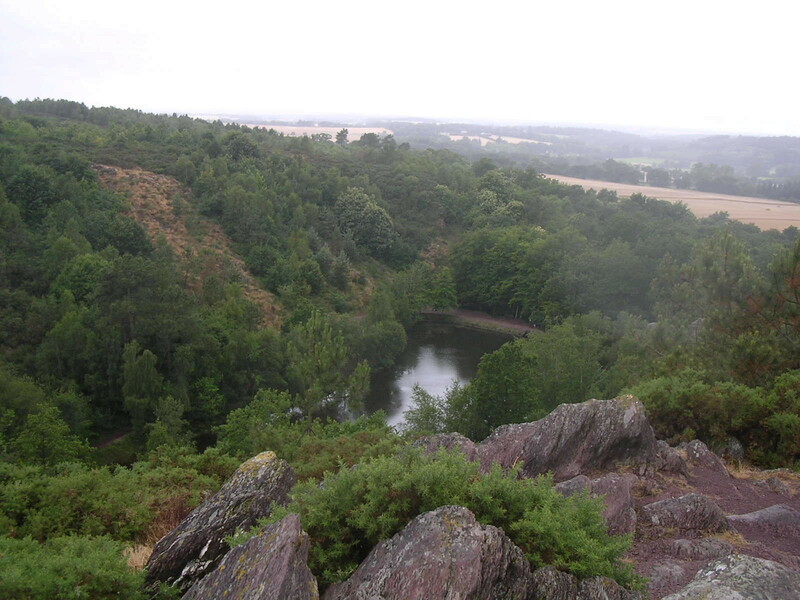 It is said that in the Middle Ages Brittany was covered by the forest which was the Broceliande of Arthurian legend. For those whose familiarity with such legends is bounded by British references, it may come as a surprise to know that the major medieval romances, including Malory, were entirely at home with Arthurian cycle taking place, to a large extent, in Brittany. Nor is this surprising, as its name derives from the fact that it was settled by the British. In 2004 the museum in Rennes had an exhibition devoted to a reconstruction of the vessels used by these early settlers from Cornwall, Wales and Ireland, who colonised what was then Armorica from the 5th century. It was they who converted it to Christianity. They also 're-Celticised' it renaming it 'Little Britain' (Britannia Minor). It did not officially become part of France until the 16th Century and has fiercely retained its Celtic identity, embedded in its language, folk music (reminiscent of Ireland) and the modern movement to re-establish its independence from France. We stayed in the grounds of an imposing 14th Century chateau, a half hour's drive from the centre of Broceliande. 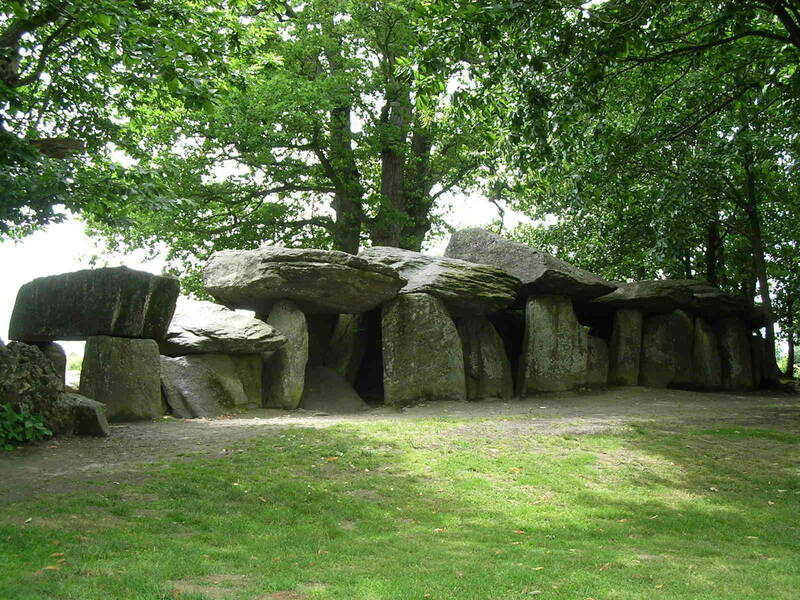 We visited a few of the major Neolithic sites, both in the west of Brittany in the gulf of Morbihan, where Carnac and most of the major sites are. The sites are unimaginable in their number, preservation and what they can tell us of that period. At that time the immense gulf of Morbihan hardly existed, with the water level much lower. This permitted cairns and passage graves to be built on what are now islands in the gulf, and on the tip of what is now a peninsula. It may also mean that many such are buried in the sea, though, as the Neolithic builders preferred to choose hilltops and high places for many of their graves, most have probably been preserved. Only one we visited charged, because it is on a private island in the gulf, but that is also one of the most important, because of what it tells us about how some Neolithic people treated monuments they had not erected themselves. So let me begin there, and return later to Broceliande and its legends. The major sites in the gulf are Carnac and its environs, Locmariaquer (which is within a 40 minute drive) the peninsula of Rhuys and the Isle of Gavrinis. 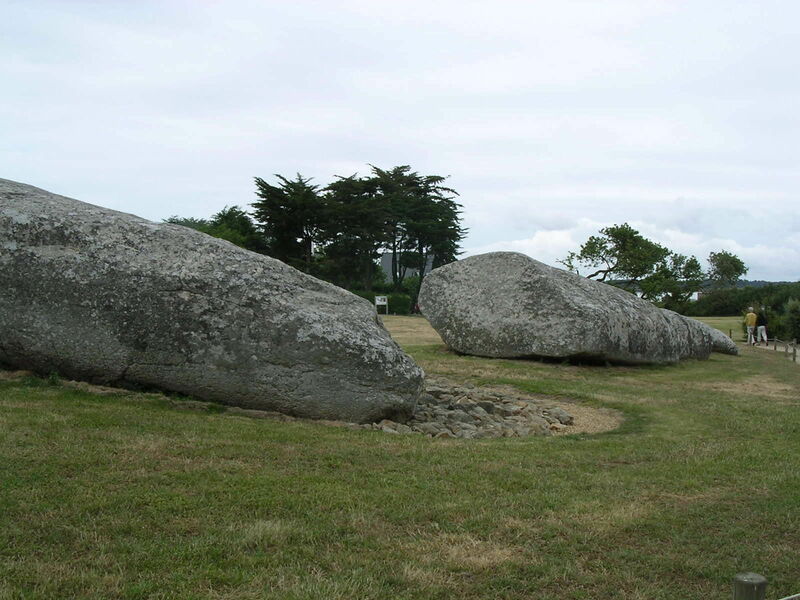 Most people are familiar with the alignments at Carnac – three 'fields of menhirs' contained thousands of stones in orderly lines, at Menec, Kermario and Kerlescan, all within a few kilometres of each other, with other smaller sites, close by. The three form one line over 4 km. Within a circle of about 7 km around them are numerous dolmen, tumuli and other menhirs. This site will give you an idea of their breadth. I will say now I did not visit the alignments. This is because I last saw them over 20 years ago, when it was possibly to wander among the stones freely. Since then they have been fenced off, a new road had been built alongside Menec and a Visitors Centre has been erected to restrict access. This is necessary for preservation, and, if you have never seen these alignments, their extent is impossible to imagine, and I would recommend a visit. But I went to Locmariaquer. Here there is also a new Visitors Centre for the three main sites, but there are at least four others, all told comprising three dolmen, three tumuli and a menhir. But what a menhir! Though now broken, in its day it stood 20 metres tall and weighed nearly 280 tonnes. Even so, it was smaller than the 'great menhir' which once stood nearby and appears to have been deliberately torn down by the makers of the passage tombs at Locmariaquer and on Gavrinis to supply a capstone to the central chambers in those tombs. It is easy to see how we can be so certain about this: the missing 'great menhir' had carvings on it, of oxen with large horns and what may be a plough. These carvings were turned inward when the capstones at the Table des Marchands in Locmariaquer, and the tomb on Gavrinis were built, so they can be clearly seen from within these tombs. In addition, a large triangular stele decorated all over with the crozier (shepherds' crook) design once stood outside, but is now part of the great central chamber of the Table des Marchands, which has been carefully restored by placing small stones around the main uprights and all over the tomb to reconstruct the cairn which was once there. From the visitors Centre it is a short drive down the peninsula to Pierres Plates, which is a massive passage tomb built below ground, so that only the great, flat stones spanning the uprights can be seen from the ground. It is completely accessible at all times, so one can walk all the way through it. But its atmosphere is strangely deserted, like the other monuments we visited at Locmariquer; something I have learned to associate with the presence of too many humans who visit without respect for the spirits of these places. To gain access to the Isle of Gavrinis means taking a ferry across the gulf. It runs hourly until about 5.30pm in the summer, and the trip only lasts about 20 minutes and is enjoyable, with a running commentary on the gulf and its islands (in French, of course!). Once on the island, the way to the tomb is fenced off, and visitors must leave all their bags and cameras in a locked box in the shelter near the tomb. Photographs are not permitted. You are then treated to a 20 minutes explanation by the Guide (in French) of the 'meaning' and history of the tomb, which reproduces everything in the pamphlet you are given when you purchase your ferry ticket, before you are allowed in. But that does not matter, for this tomb, though small in size, is fully equal to the magnificent tomb at Newgrange in County Meath, Ireland. though I cannot give you photographs of this magnificent tomb, there are many on the Gavrinis official website. The chamber is small in proportion to the long passage, but the cairn has been preserved, mainly because the island has long been in private hands, though the tomb itself is now in the ownership of the regional authority. 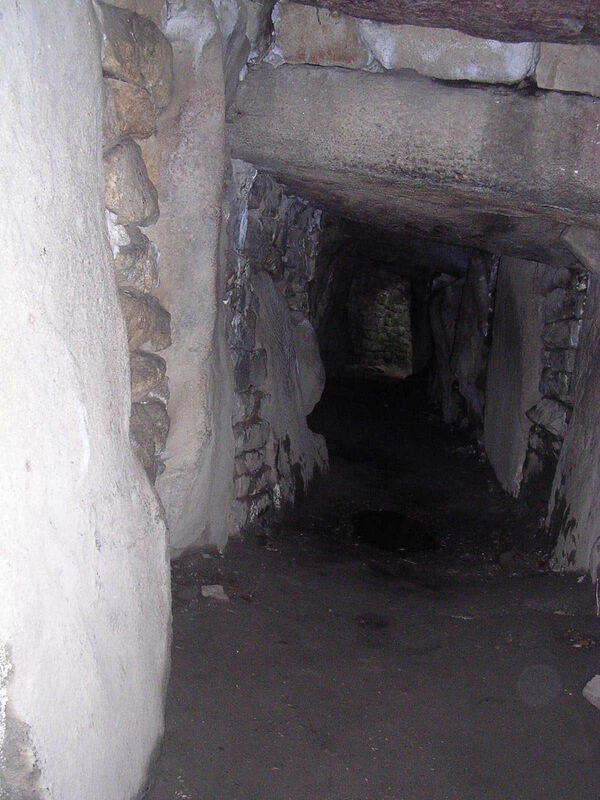 The tomb seems to have been closed sometime around 3000 BCE, and the closing ceremony involved the burning of light wooden structures which had previously stood outside, and packing the passage with loose stones. The whole facade was then buried in stones. The stones used to build the tomb were chosen or cut to fit exactly, which is unusual. Like Newgrange (and most of the other Amorican tombs) it faces towards the rising sun of the winter solstice, but not as accurately as Newgrange, so the chamber will never have seen that sunrise. But the amazing thing about Gavrinis is its carvings. Almost every stone in the passage and the chamber is carved, some with symbols seen at Newgrange, some with symbols seen elsewhere: axeheads, wavy lines, whorls, crosiers, zigzags, 'serpents', chevrons, and, of course, the ox on the capstone of the chamber. The whole tomb still seemed to be 'occupied' to me by a spirit, but, because of the number of visitors and the short time one has before the ferry arrives to return to the mainland, there was no chance to explore this. Can there be anything to rival Gavrinis? Well, yes, one more site we found. In fact, we deliberately devoted the day to it: a trip of 90 minutes each way for us, as it lies to the south east of Rennes near the village of Esse. 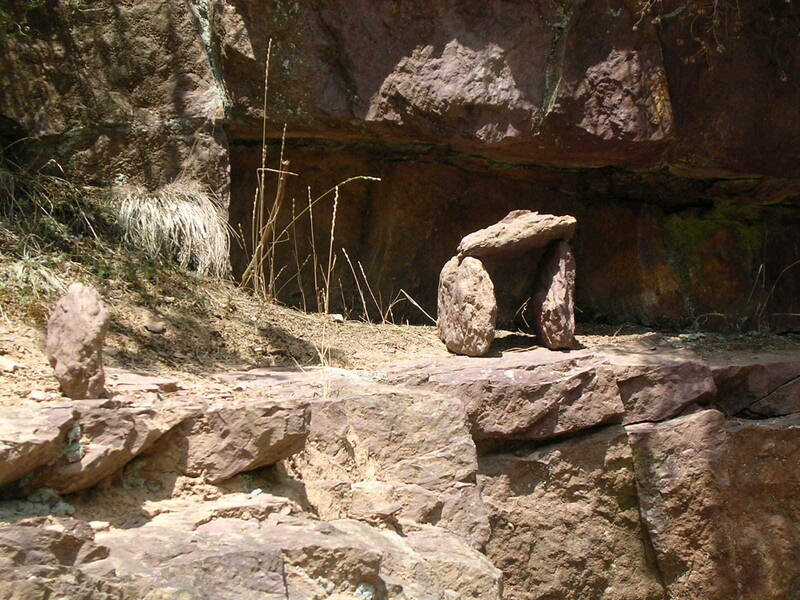 This is the Roche Aux Fees: the Rock of the Fairies: an enormous dolmen constructed of fat slabs of reddish stones lying on a small summit in the middle of the countryside. It is 19.5m in length and, once past the entrance, it is possible to stand up inside it. The Regional authority has landscaped the site so that it has a car park and toilets, but these are away from the megalith, so visitors can approach with respect and in peace. And beside it spreads an ancient chestnut tree which is very much 'occupied'. Indeed, the whole site speaks clearly of a presence and I left a gift (perishable, of course) in a hole in the tree, for the local wights. The only other visitor at the time was silent, removed his sandals to enter, and sat quietly inside for 20 minutes or so. Go there if you wish to visit something which has a living presence. And so, I return to Broceliande, which you may or may not find on a map, as the forest is properly now called the forest of Paimpont. I am told there is a Visitors Centre in Paimpont, where one can obtain a lot of information about the forest. But our Guide was an adopted Breton, who offered at the prompting of a conversation in the bar, late at night, when there was only the four of us: she and we and the young Breton bartender we had befriended, who loved the local folk music and the contemporary versions of that. 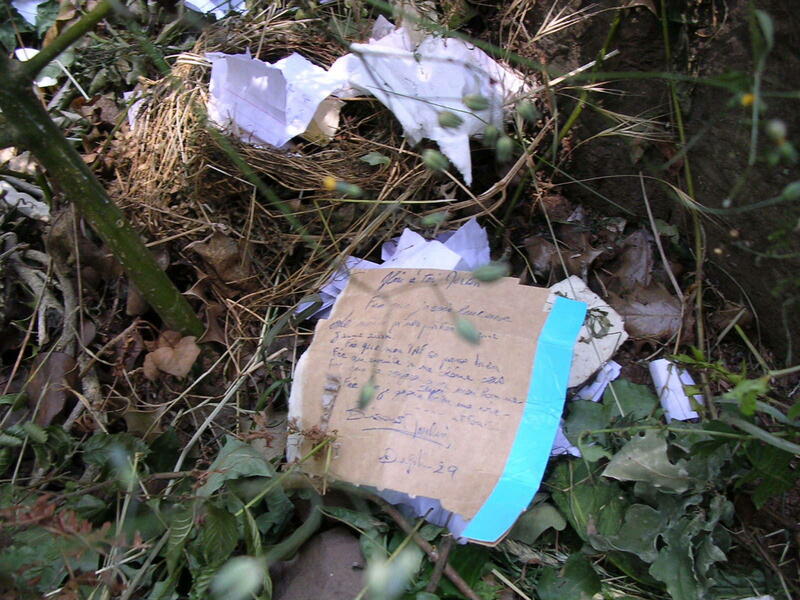 That night we talked of the spirits of the land, and he was indignant that so many people visited the forest sites and left rubbish, which he would sometimes spend time clearing up. We talked about the proper offerings for wights, and of the magic of the land. And our Guide said she would take us to Merlin's Tomb, which, even with the tourist maps, was difficult to find. "And touching Breton sands, they disembarked. Even to the wild woods of Broceliande. And none could find that man for evermore." Vivien has many names: Niniane, Nymenche, Uiuiane, Nimue or Nenive. She was the Lady of the Lake in the Vulgate Cycle. In the medieval romances, Merlin found her when she was 12, fell in love with her and taught her some magic. Later, as an adult, she met him again and coaxed him back to her lake, where he taught her magic and she imprisoned him. In Broceliande there are reminiscences everywhere of the legends, usually small Neolithic sites which have been renamed, as with 'Vivien's Hotel'. Deep in the forest there is the Lost Valley, where the lake is, which is said to be the place of his imprisonment. The valley contains much iron ore, which disrupts compasses, so the lost remain lost. The valley was badly burnt a few years ago and the Regional authority restored it, and commissioned an artist to produce a work of one bare tree coated in gold leaf and surrounded by four or five stumps of burnt trees, to represent that resurrection and hope, among forests which are burnt or destroyed by thoughtlessness. No fires or camping are permitted in the forest. The main road through it is shadowed in a deep, bright green of a hue I have never found elsewhere, even though I live in one of the most rural counties in England. It is so quiet, so green, that even the most cynical must feel some thrill of magic as they drive through it, or cycle, or walk. Once, before the early 19thcentury, Merlin's Tomb was a place of 6 stones, a small Neolithic site of some kind. But in the 19th century it was destroyed, supposedly by people hunting for treasure, and now all that remains are two stones against some earth, out of which grows a spindly tree. And the tree is hung with rags, and the earth is coated with letters to Merlin. The letters are mainly from the young, and usually local. We read two, one a cry from the heart for the love of a youth who was heedless of the writer’s amour; the other more like a shopping list for Santa Clause, full of desire for various consumer products. And, of course, there were tea lights and candles. Not far from Merlin's tomb, but in another direction, there was a springhead known as The Fountain of Youth where, according to local myth and the sign placed there by the Regional authority, the local people brought their children at night on the summer solstice to be recorded and blessed. If the child was brought the day after, if had to wait until the next year, and so its age was recorded as a year less. There is no indication of how the church regarded this practice, though it apparently went on until possibly the 19th century, or even later. It cannot be carried out now because the person who had moved into the house near this place has diverted the spring for his own use, so the stream-bed is completely dry and there is no longer a springhead. We walked downstream from there and found an open pit, a site of mining which is far too small to be modern. The pit bottom slopes slightly, and there are crevices in the sheer sides of stone around it. On these crevices, and at places on the pit floor, were miniature dolmen made of stone. 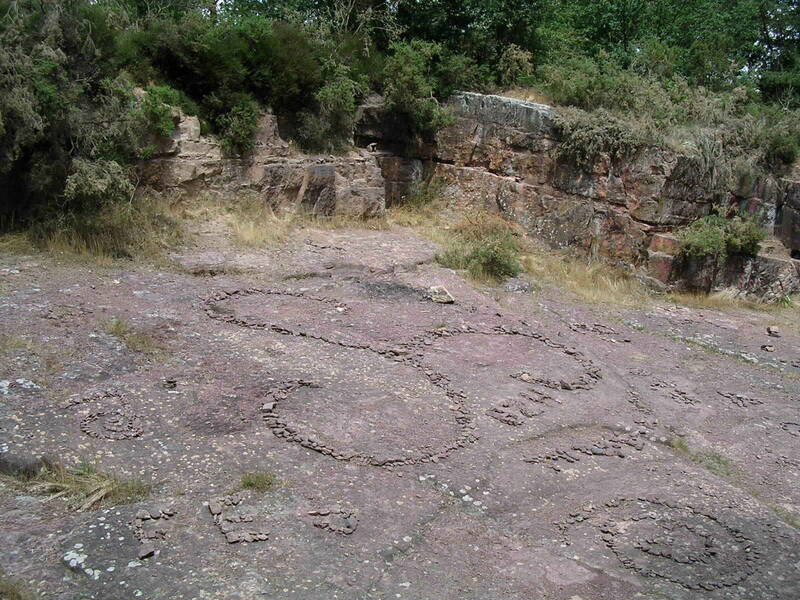 And, on the pit floor, was a large triskelion made of small stones, and the initials 'BZH' beneath it: the letters which stand for Breizhe: Brittany in the Breton Celtic language. Our Guide told us that 'Satanic rituals' were carried out here. We attempted to obtain a distinction between pagan and Satanic, and we thought she understood (as she had recently talked of neo-pagans druids), but she insisted she was correct. So medieval romanticism reinterprets Neolithic sites for its own purposes, and the commercialism and causes of modern society reinterprets medieval tales and Celtic symbols in its own tongues. But the requests to Merlin, the political slogan, possible Satanic rituals and the loss of the stream of the Fountain of Youth, are not the only appropriations of the magic of legends for their own purposes. 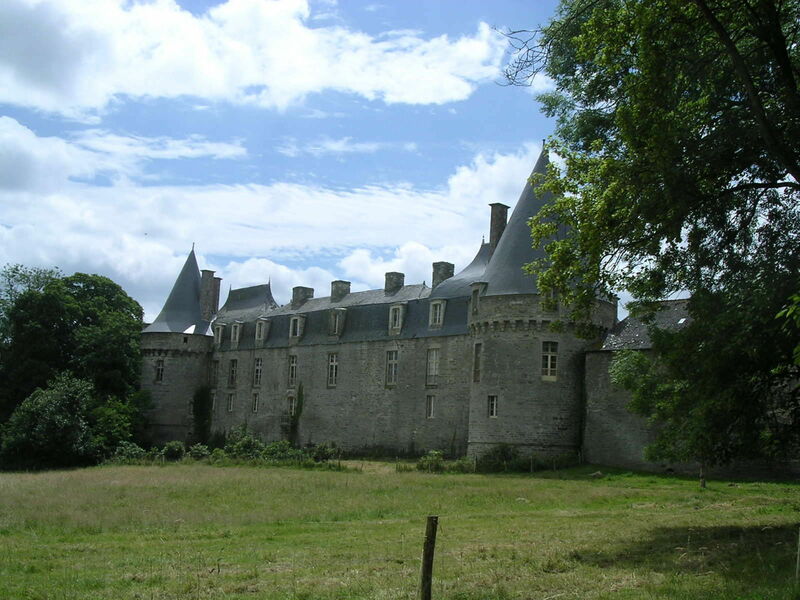 There is a chateau in the forest which has been purchased by a company which uses it to run faux-medieval jousts and other 'medieval' entertainments during the holiday period. The costumes have more affinity to Disney than historical accuracy and the events show little attempt to introduce people either to history or to the legends which are the inheritance of the area. But despite the kitsch appropriations, this is a land which holds real magic, and real history, in quantities rarely found elsewhere. Here are people who cherish the legends, and who try, in whatever way they can, to protect it. For they feel something for this land of great beauty, ancient artefacts and legend, and they wish it to remain unspoiled. And so, like so many, we will return again, to the grounds of the chateau, to meet our friends, to visit more tombs, and to walk the forest. And maybe, if we have drunk some wine with our excellent lunch, we might hope to emulate Merlin, looking into the lake of the Lost Valley, and seeing reflected in it images of another world. But if we don’t, the Brittany that exists here and now is quite sufficient. © text and photos copyright Alexa Duir 2003. All rights reserved.